I have two external cameras - one in my front porch and one in my backyard. They both seem to get a bit too much of false motion alerts due to shadows, specifically when the sun hides behind clouds and comes out from the clouds. My porch camera has a total of 6 zones, the backyard camera has 4. I usually stick with the default settings and one zone. I adjust the zone to the traffic area to be monitored. Yes, light and dark does trigger alarms and I just live with it. 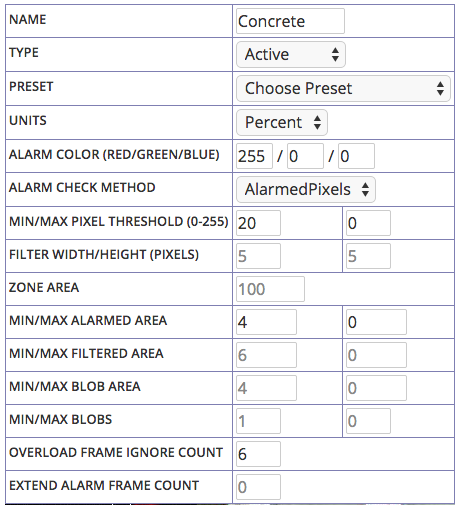 You could try turning the frame rate down on your cameras and reduce the image size. This will reduce the amount of images stored during an alarm event. Turn off CREATE_ANALYSIS_IMAGES as well. This is a common problem with any surveillance system. It is unlikely you are going to eliminate the problem entirely. All you can do is minimize it. What you are going to find is that improving the situation at a certain time of day or weather pattern whille negatively affect motion detection during other times of the day or weather. So the question becomes, how much time do you want to spend on this versus just going through the motion events to find what you are looking for? Ultimately, no one can give you exact steps because every single camera and its view is unique. We can only give you guidelines, and you have to figure out what specific settings work for you. -Use the MAX Area fields to tell zoneminder to ignore frames with too much motion (e.g. when the sun goes behind a cloud). Experiment to determine what values work best. -Turn on blob detection, turn on analysis frames, and set your Units to pixels. Now look at the statistics for each motion event. It will tell you exactly how many pixels it "counted" as motion. This will let you determine, more preceisly, a number to stick in the MAX area fields. It will also idenfity exactly which parts of your view are triggering the motion so that you can possibly do something about that. -Read the documentation in the FAQ for setting different states. This will allow you to have different settings during different times of the day. Thanks for the info knnniggett; I ended up spending a couple of hours playing with alarm areas and for the most part, I think I got it dialed in enough to eliminate a large chunk of false alarms. Of course, I still get them from time to time - but to give you an idea - last week, I got about 14 alarms within a 30 minute period... Now it'd be maybe 2 or 3 alarms tops per hour on an overcast day. I've found preclusive zones to work well for eliminating certain light change events like shadows and, in one part, car headlights. I choose a small area of constant colour that shouldn't be triggered by real motion, for example a part of a wall that is quite high above normal traffic areas. I then create a small zone there and set the pixel threshold quite low but the minimum pixels to at least 70% of the pixels in the zone. I also just use alarmed pixels because I don't want to burden the processing for this zone. Definitely helps eliminating whole scene lighting changes. the solution is darknet and Yolo... I'm still to this day tweaking my shadow settings but I have zones that are so far away I can't do much about it or I lose actual events I guess. I even looked at things as far as calculating total score for events. this also didn't prove any help because sometimes actual events have very low score and big shadows and movement have high scores.